AFTER being a migrant worker for over 10 years, Wu Lizhu, nicknamed Zhuzhu, returned to her hometown in Lanbiao Village, Jieyang City, Guangdong Province, and set up a library free of charge for local kids. This was two years ago. Before that, she had spent four years working with a nonprofit organization in Beijing which provided assistance to the children of migrant workers and women’s co-operatives. “When I returned to my hometown, it grieved me to find teenagers leaving home to make a living as I did a decade ago,” Zhuzhu said. Zhuzhu started her library in a two-story house in her village, a space of about 60 square meters. It is a cozy place, simply furnished, with children’s books – mostly picture books – on wooden bookshelves. When she first moved in, however, the doors were practically falling off their hinges and the place was very shabby. With the help of several local children, she cleaned the rooms, painted the walls, and put up decorations. 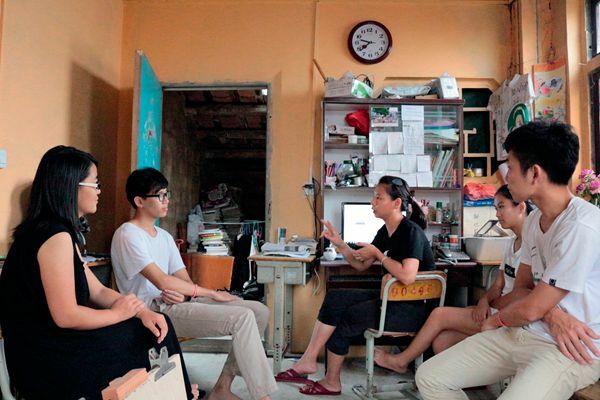 Zhuzhu (third left) and the volunteers discuss details of their activities. Every afternoon during the summer vacation, kids wait outside for the library to open. Some of them come to ask Zhuzhu when the summer camp will start. The summer camp is arranged by a nonprofit organization dedicated to improving children’s reading and writing skills in underdeveloped regions. This year, the summer camp brings children closer to local customs, culture, and artisans.